When Intel introduced the i865PE/i875P chipsets over a year ago, the Pentium 4 overclocking changed, but many enthusiasts seem to have forgotten that the rules stayed the same. Latency is just as important as bandwidth, for the average overclocker/gamer latency is actually more important! And so in this day and age, pretty much everyone reviewing high-speed memory, except us, has been praising the introduction of high speed DIMM's. Sure they let you go higher than ever before, but only at a very steep price. Since low latency high speed DRAM just doesn't exist, we have to look towards lower than average latencies in high speed DDR to find the best marriage of the two worlds. For that, we'll be testing out OCZ's recently released PC3500EB Platinum Dual Channel Memory kit. Each stick in this 1GB kit is 512MB in size, and comes from the familiar family of OCZ's Enhanced Bandwidth line of memory products. The timings of these two 512MB PC3500EB Platinum DIMM's are not the tightest we've ever tested, but they're much better than the average for PC3500 DDR. Each stick is rated to run at 217 MHz with memory timings of 2.5-3-2-8 on AMD systems, and 2.5-3-2-6 on Intel rigs with a supply of 2.8V. What's different about this review, is that we're throwing in some business oriented benchmarks, so you can see just what kind of performance gain you can expect from a little overclocked DDR. Overclocking a work PC isn't for everybody, but with motherboard manufacturers providing software overclocking utilities, you can squeeze a little bit more out of most rigs without sacrificing much in the way of system reliability. According to the official Micron documentation, by default this DRAM is only supposed to run at 200 MHz with memory timings of 3-4-4-8, and 2.6V. I guess with a bit more voltage they can run tighter... but who knows what effect this will have on their longevity, if any. Each OCZ DIMM is flanked by a total of sixteen 64Mb DRAM modules, so take note that these DIMM's are double sided if you plan to mix and match with your current memory. Unlike some memory that we've reviewed previously, the OCZ PC3500EB Platinum is not just intended for Intel based systems, it will also run perfectly fine on AMD PC's as well! As usual, we tested the OCZ PC3500EB Platinum memory on our Athlon64 test bed first. At a stock speed of 200 MHz, the OCZ memory was actually able to run with memory timings of 2.5-2-2-5! We started to slowly raise the clock speed of the motherboard a few MHz at a time, at 217 MHz we had to increase the memory voltage a bit to 2.8V, or stock voltage of the memory. To our surprise after that we were able to get the memory all the way up to 230 MHz while using memory timings of 2.5-2-2-5! Loosening the timings did not allow us to get any higher but still this is pretty impressive for high speed DDR! Next, we plugged the OCZ PC3500EB Platinum memory into the P4 system, and were extremely pleased to see that it able to run with a RAS-to-CAS of 2, at 200 MHz FSB. This with just 2.5V! Just in case you aren't aware, RAS-to-CAS is the most important memory timing for Pentium 4's, not CAS latency. Overclocking on the Intel platform began at 200 MHz, which then saw the FSB increased in 5 MHz intervals. At 215 MHz we needed to a bit more voltage, and cranking it up to 2.8V solved the problem. We continued overclocking all the way to 230 MHz, again this is using 2.5-2-2-5 memory timings. To get any higher though, we needed to lower timings to default of 2.5-3-2-6. That however, had a negative impact on overall performance, even at 236 MHz FSB it was slower. 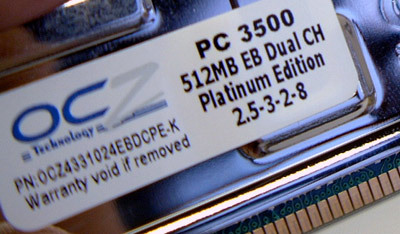 For benchmarking we ran the OCZ PC3500EB Platinum memory at 230 MHz with timings of 2.5-2-2-5. So let's have a look at those benchmarks now!